Our son,s name is Grant, so my wife wanted to photograph a town sign or something. Well, we came across a train parked on the main, and, I saw an engine house about a half block away. 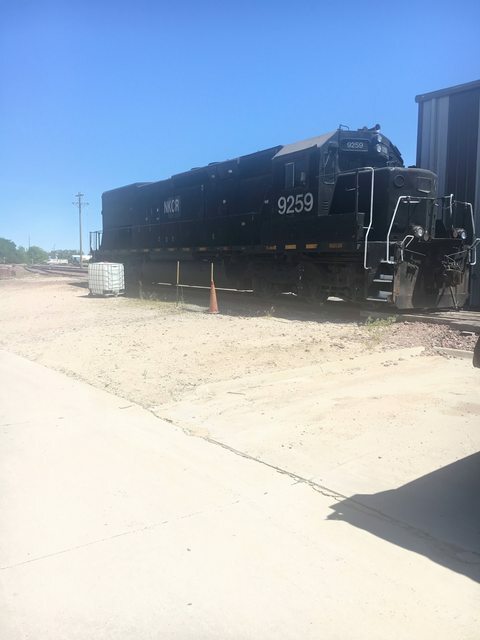 It turns out that Grant, Nebraska is the home of the NKCR railroad. This is a part of Omnitrax. On the main was a black SD45, 7427. On a siding next to the one stall shop was A black tunnel motor, 9259. It was on Sat., so no one around to talk to. The small yard was full of mostly grain hoppers. Maybe photos when we get home. That is a prime example of a struggling prairie shortline. Their traffic over a sprawling network of branch lines serving grain elevators has dwindled over the past several years as smaller elevators are squeezed out by larger shuttle elevators located on Class 1 railroads. 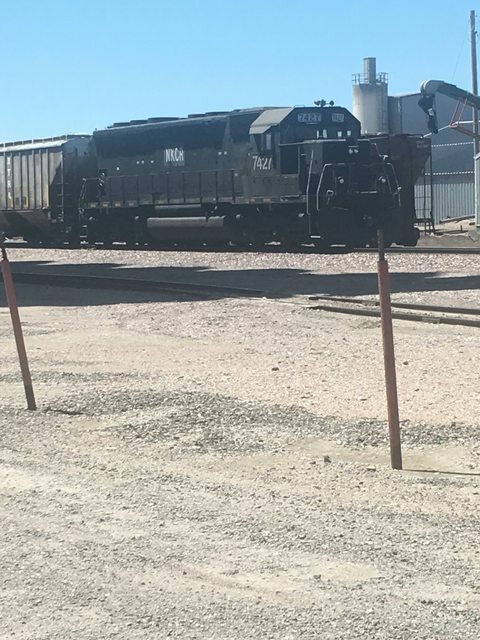 The locomotives you saw in Grant operate the "Scoular Shuttle" which takes grain hoppers from smaller elevators east of Grant to the large shuttle elevator on the NKCR at Venango, NE (right at the Colorado state line). NKCR handles unit grain trains from BNSF at Sterling, CO to Venango. These trains use BNSF power. You did good getting those old drab black ex SP units. They are former LTE leasers, and represent some of the first big power LTE leased, as they had been primarily scrapping locomotives before getting into leasing road power. They are 20-cylinder gas guzzlers, and OmniTrax will have them off the roster shortly. Other similar units were recently scrapped, and these likely will suffer a similar fate. Thank you for the report. Not much we hear of this operation because you really do have to be off the beaten path to see it. Last edited by ShortlinesUSA; 06-07-2018 at 12:37 PM. FWIW, you may have been one of (if not the last) person to photograph 9259 in Grant. It was waybilled out of there on 6/5/18 for Chicago Heights, IL for scrapping. Wow, hope my photos upload when I get home. Here are photos of the NKC's big power. These were taken on Sat., 6/2/18. As mentioned, the 9259 was supposed to leave the property on 6/5/18. Sorry , but sun was not in a good spot for photos. Last edited by mowingman; 06-23-2018 at 05:16 PM. If nothing else, you have shots of them for history's sake. Thanks for posting!